FBI Director James Comey on Thursday clarified a statement he made earlier in the week that the FBI never conducts electronic surveillance without a court order, saying, "There are exceptions" to the warrant-first rule. "It remains true in the over-, over- overwhelming number of our cases—we have court authority to collect the content of emails or telephones," Comey said during a discussion at the Brookings Institution. "But there are exceptions to the warrant requirement. " Comey gave a speech warning that strengthened encryption measures in Apple and Google's new phones could lock out law enforcement from conducting the surveillance necessary to pursue criminal investigations and thwart terrorist plots. He cautioned that the "post-Snowden wind" blowing toward heightened privacy has swung too far and that electronic data should not be "beyond the law." But Comey was asked to explain his answer to a question in a 60 Minutes interview that aired on Sunday, where he claimed that the FBI never collects digital information without first obtaining judicial approval. "When I was asked that question, I gave an answer that I thought was fair and accurate, Comey said. "And people gave me feedback afterward saying it was insufficiently lawyerly, it should have been longer, and what about the exceptions. And I think that's very fair feedback, and I wish I had thought of it in the moment." Comey gave two examples when the FBI is able to conduct surveillance without a warrant: when consent is obtained, and during surveillance of foreign suspects under Section 702 of the Foreign Intelligence Surveillance Act. That law allows for "incidental" collection of Americans that electronically communicate with the foreign target, a practice that privacy advocates, including Sen. Ron Wyden, have slammed as a warrantless "backdoor search" loophole that infringes on civil liberties. Comey's response in the 60 Minutes interview was less nuanced. When asked by journalist Scott Pelley if there is ever surveillance without a court order, Comey replied: "By the FBI? No. We don't do electronic surveillance without a court order." Pelley pressed again, saying, "You know that some people are going to roll their eyes when they hear that?" But Comey doubled down: "Yeah, but we cannot read your emails or listen to your calls without going to a federal judge, making a showing of probable cause that you are a terrorist, an agent of a foreign power, or a serious criminal of some sort, and get permission for a limited period of time to intercept those communications. It is an extremely burdensome process. And I like it that way." Comey spent much of his discussion on Thursday reiterating his fears that technological advances in encryption will make it harder to defeat the "bad guys." He noted that the debate provoked by Edward Snowden's leaks last year has been important, but he suggested that tech companies are going too far with some of their new privacy measures." He urged an update to a 1994 wiretapping law, the Communications Assistance for Law Enforcement Act, to ensure that intelligence agencies can access the various and expanding types of electronic communications. 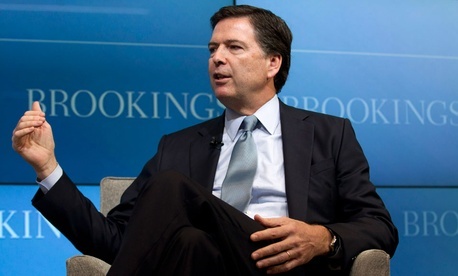 "Encryption threatens to lead us to a very, very dark place," Comey said. "No one in this country should be beyond the law."